In the days before I arrived on campus, the student-run Stanford Daily and Stanford Review published article after article denouncing me in the most lurid terms. It was claimed that I “give license” to the “oppression” of Jews, and that Muslims at Stanford were endangered by my work. It was charged that I have incited a mass murderer and approved of restricting the right to vote. My work was characterized, without any specific examples, of being not only inaccurate, but also inflammatory, offensive, hateful, and dishonest. But that was nothing compared to what Stanford administrators had ready for the event itself. Nanci Howe, Associate Dean and Director of Student Activities and Leadership, and Snehal Naik, Assistant Dean and Associate Director of Student Activities and Leadership, made sure that the hall was packed with students who had no intention of attending the lecture, but were there only to sabotage it by denying seats to people who actually wanted to attend. They even kept out some members of the College Republicans, the group that was sponsoring the event. The fascist students stood up and walked out after just a few minutes of hearing me. Then, after the walkout, Howe and Naik refused to allow in people who actually wanted to attend, refusing repeated requests to do so. They also refused to allow the Young America’s Foundation to stream the event, clearly because they knew what was in the offing and did not want video going out live that would show just how much Stanford has deteriorated and how opposed it is to free discourse. I had no contact with Howe. Naik greeted me with great warmth and affability, and actually said, “We’re glad you’re here.” Oleaginous insincerity oozed from his every pore. Belying his unctuous demeanor, he was so unyielding that at the end of the event, when College Republicans (who have been bullied and victimized by Stanford administrators all through this process, and egregiously and repeatedly smeared in the Stanford Daily and other student publications) asked him if some of the members who had not been allowed in could now come in for a group photo, he refused to allow even that. At that point, I asked him if he had always been a fascist, or had become one recently. He looked embarrassed. He should be embarrassed. 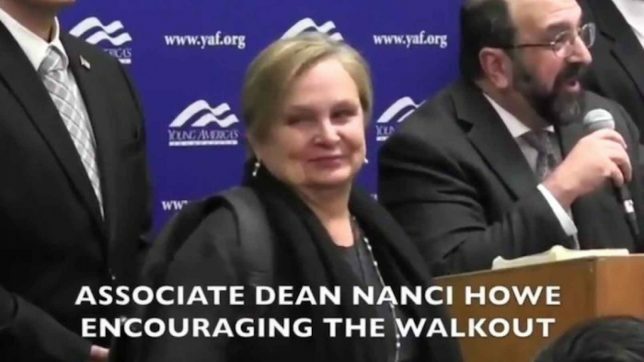 Here is video of Nanci Howe happily circulating among the Stanford students walking out of my event there last Tuesday, patting them on the back and chatting with them. Below is full video of the walkout. Howe appears at 2:44. She appears again at the end of this video, grimacing as I criticize Tessier-Lavigne and Drell for failing to teach or defend the freedom of speech, and for acting to crush dissenting opinions. With Howe stage-managing the disruption of the event this obviously, it’s clear now why she refused to allow streaming. Fascism has no place on university campuses, or shouldn’t, but thanks to Nanci Howe and Snehal Naik and so many others like them all over the nation, it is dominant. A sane university would fire Howe and Naik immediately. However, it is likely that they are not responsible, but were just executing orders from higher up. It is Stanford President Marc Tessier-Lavigne and Provost Persis Drell who should be fired. But it is much more likely that they will be lauded and hailed by their peers for their denial of free inquiry.